This is a vathal or vatral made using raw mangoes, prepared, sundried and stored for a year. This vathal is used in making a traditional kozhambu and also an instant pickle is made using this. 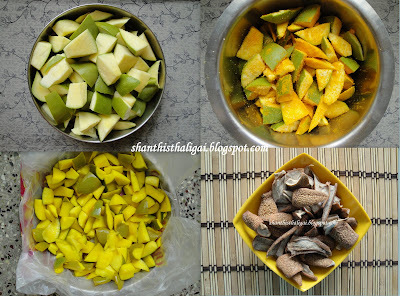 Wash mangoes and cut them into slightly big pieces. Transfer them to a ceramic jar or glass jar. Add salt and turmeric powder. Mix well. Shake well OR turn it upside down with a ladle daily for 3 days. Dry them in the hot sun for 2 to 3 days till they are bone dry. Store in containers. This can be stored for more than a year. I generally ziplock them and keep it inside fridge.. Thank you for posting such amazing recipes. I am learning a lot about iyengar samayal. ippovum oru chinna bottle kai vasam vechchirukkaen. whenever there is a tasteless feel I pop one. With your recipe it is time I try making my own. thank you for sharing! Thanks for reminding us the forgotten delicacies. good pics! This is truly amazing. I have never tried it before. Thanks for sharing. This is my favorite when it is added to vatha kuzhambu! Yum yumm! very nice!i have to try this! nice informative post. I usually make manga vathal kuzhambu. Brilliant! Could you also share the kozhambu recipe please. This look absolutely wonderful and nice to share heirloom recipes..Thanks for your lovely words and for your time..glad to follow you..